Motorists are reminded that all US 23 and KY 8 traffic in Greenup County needing access to Portsmouth, Ohio, should reroute using the Carl Perkins Memorial Bridge on KY 8 at South Portsmouth. 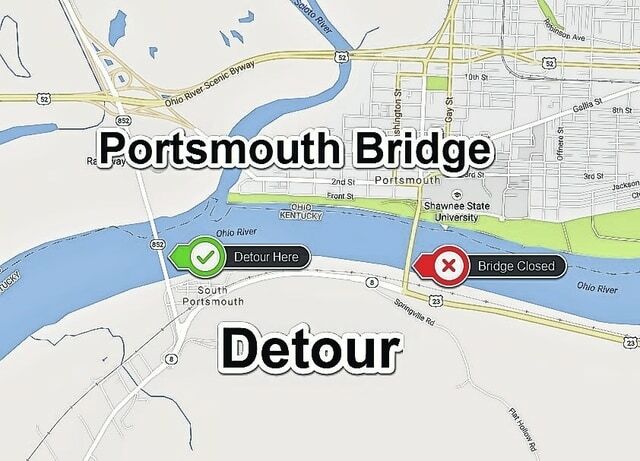 Due to an Ohio DOT maintenance project, the U.S. Grant bridge leading into downtown Portsmouth is closed. Northbound US 23 traffic should avoid the turn lane at the Grant bridge and continue north to the Perkins bridge. Likewise, southbound KY 8 traffic going to Portsmouth should turn at the Perkins bridge prior to the Grant bridge.